Those of you who follow me on Instagram got a glimpse of my trip to the J.M. 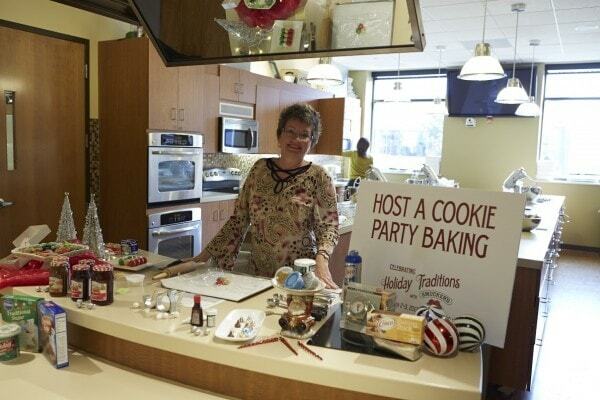 Smuckers headquarters in Orrville, Ohio a few weeks ago. 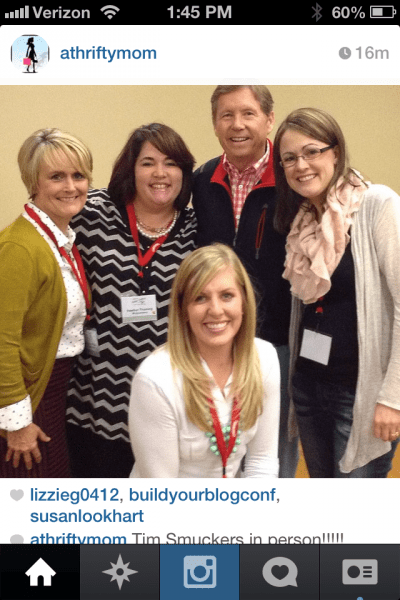 It’s was a great trip and I learned lots about the company and the product and met some fun new blogging friends! I flew into Cleveland Ohio and enjoyed a beautiful ride out into Amish Country to Orrville, the birthplace and home of J.M. Smuckers. 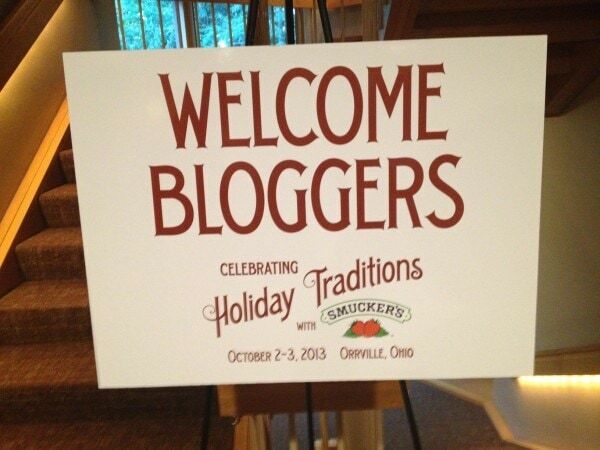 We had a fun gathering and opportunity to meet the other bloggers that evening and enjoyed some yummy foods made with Smucker products. Our day started bright and early the next day as we headed to the company headquarters. 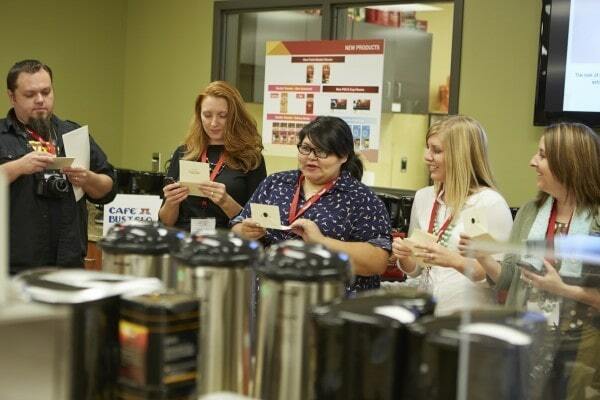 The first session we attended was Coffee 101. Although I am not a coffee drinker it was fascinating to learn the process that is gone through in developing a quality coffee product. Smuckers also owns Folgers and Dunkin’ Donuts coffee. 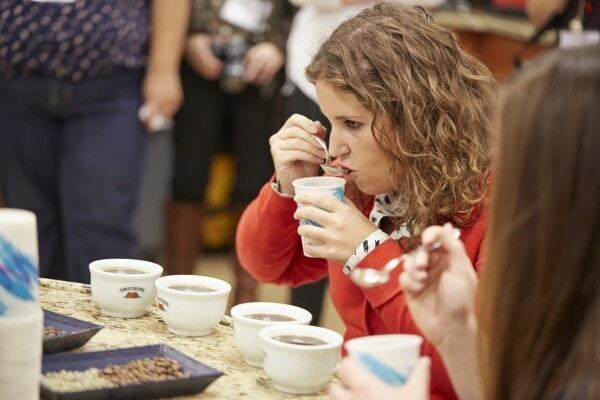 Their coffee experts demonstrated the taste testing process they go through – it is really an art! At the end of the presentation they presented each of us with a sealed envelope that contained the name of the type of coffee they felt best fit our coffee drinking profile (we had filled out a survey before the trip) Mine said Hot Chocolate!! We then headed over to the Culinary College for a little cooking fun and learning about Make Ahead Meals for the Holidays! 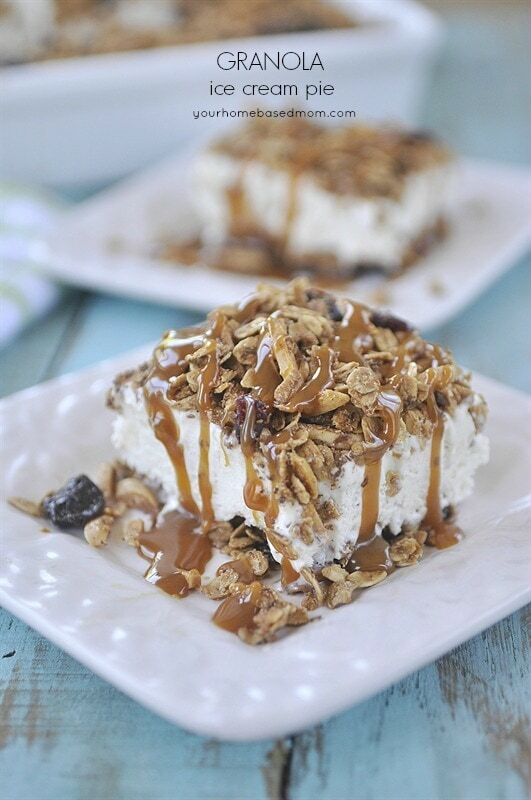 My favorite trick they shared with us was the Slow Cooker Caramelized Onions I shared earlier this week. Brillant! They also put us to work and we got to make part of our lunch. 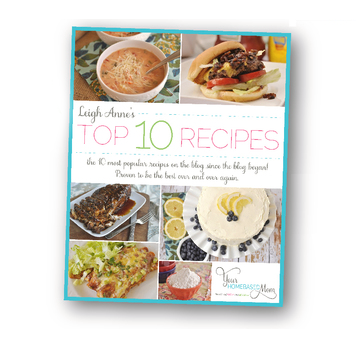 I was lucky enough to get to work with Kristen from Six Sister’s blog. As you can see she is a total doll and we had so much fun together! From there we enjoyed a yummy lunch. 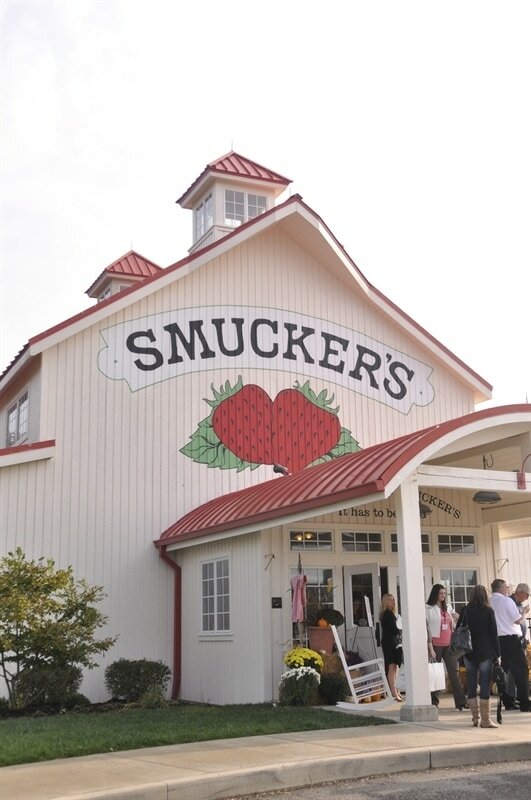 Smucker’s fed us very well and between all the taste testing we did and the meals it seemed like we were eating all the time! 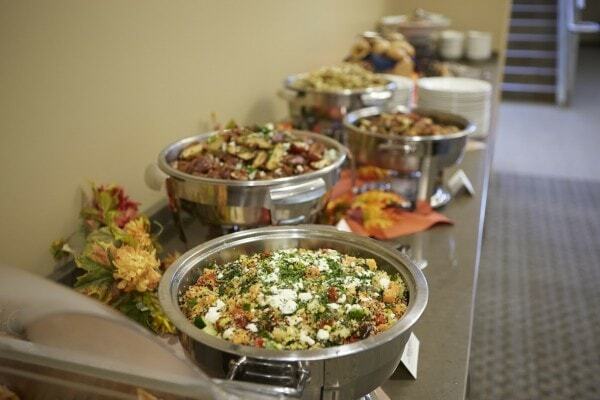 One of the meals we enjoyed was a yummy Thanksgiving dinner! 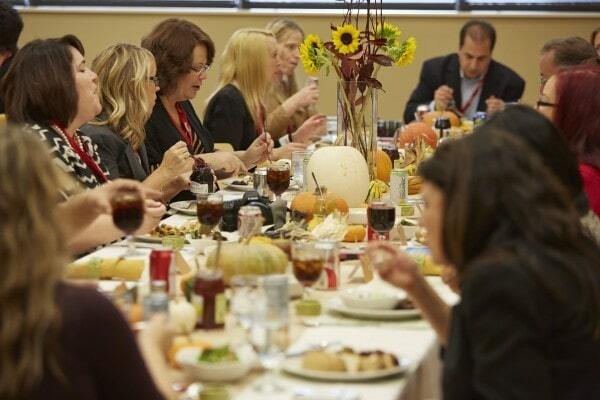 The focus of the visit was Holiday Traditions and what is more traditional than a Thanksgiving dinner! 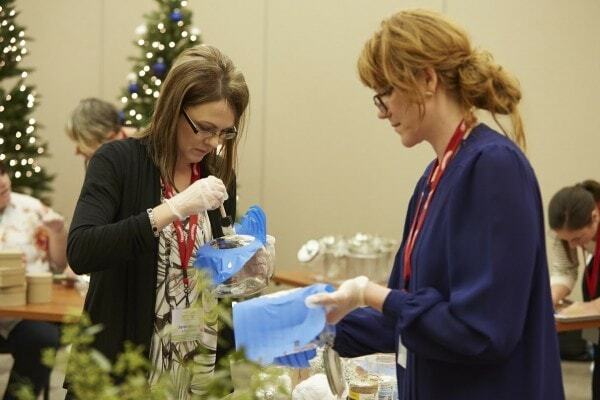 One thing I really enjoyed and appreciated was how many of the Smucker’s employees, executives and owners joined us for meals. I loved getting to know them and learning more about the company and their jobs. The afternoon of our first day we had a fun guest speaker. 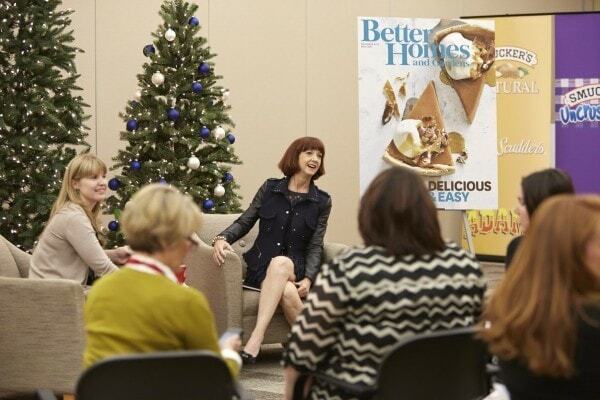 They brought in Nancy Hopkins, the senior deputy food editor for Better Homes & Gardens to talk to us. 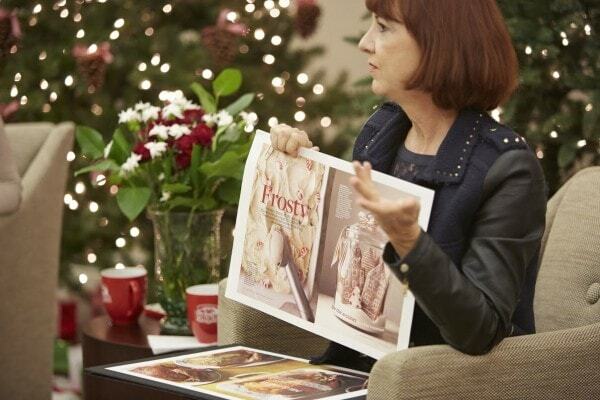 We talked about holiday food trends and she shared some of the upcoming magazine covers with us! 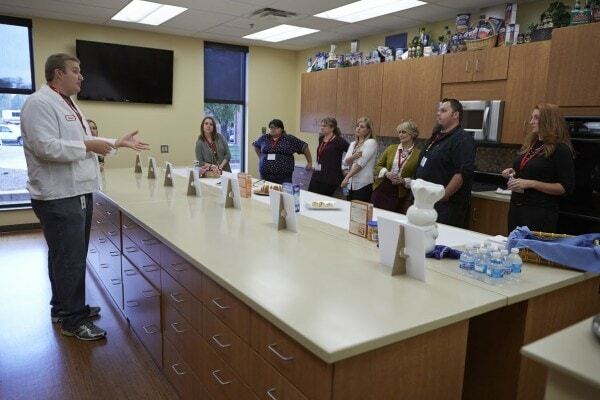 We also enjoyed several tours of the different areas on the Smucker’s campus including their test kitchens and their innovation labs. 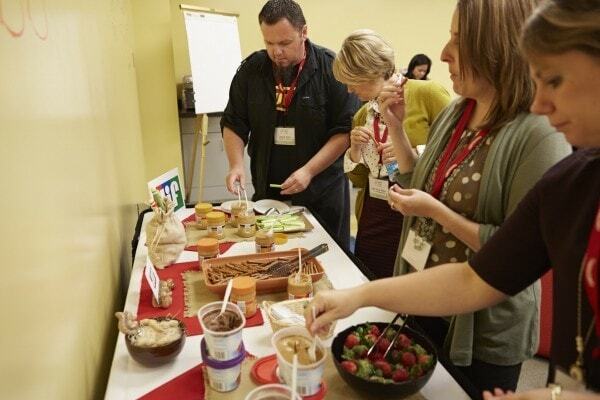 We even got to do some taste testing of new products. 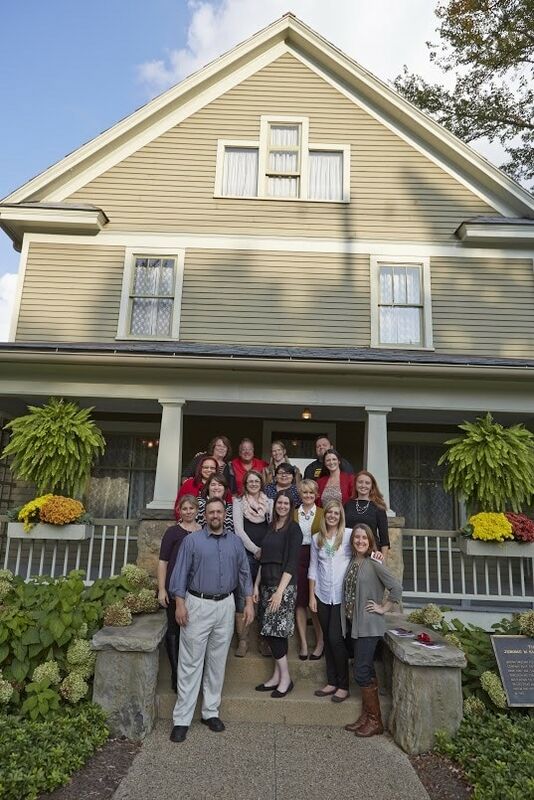 We then went for a tour of the original Smucker family home. The one that J.M. lived it! It is right on the Smucker’s campus and has been beautifully preserved and used for special gatherings and meetings. We had a fun group photo out in front. And of course we had to have the goofy photo too! We enjoyed a yummy hors d’oeuvre party that evening and then headed to bed! We started early the next morning at 6:45 a.m. for breakfast at the J.M. 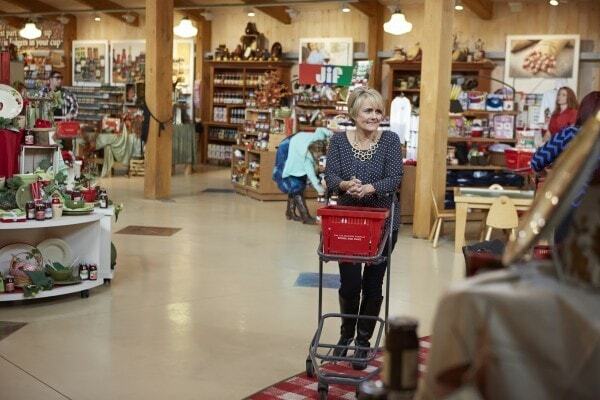 Smucker Company store & cafe. I loved this! 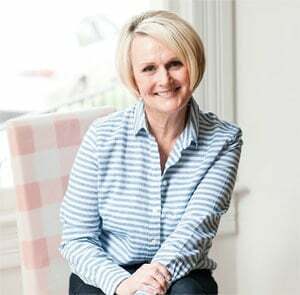 I think the one thing that surprised me the most about Smuckers was how many brands are part of the company – it’s just not jam! At the company store we were able to get a really great overview and feel for all the different brands. 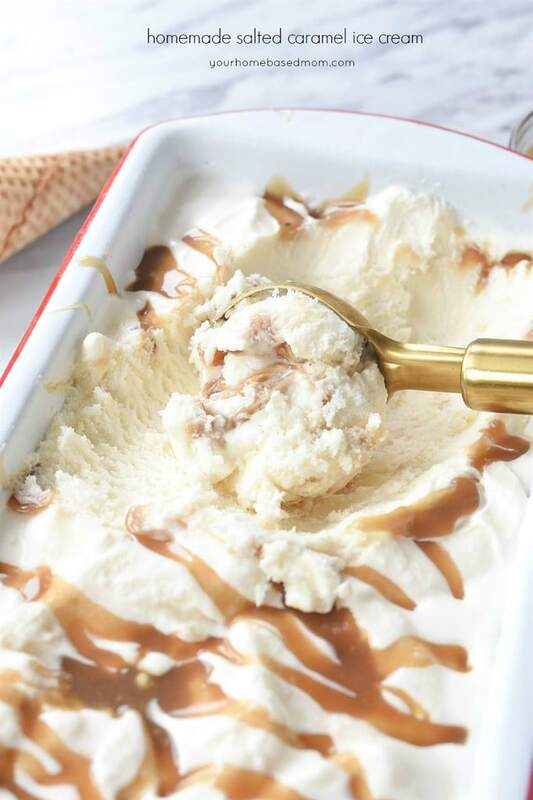 So many brands you know so well – Jif Peanut Butter,Pillsbury, Crisco, Hungry Jack, Folgers, Dickinson’s to name a few. We enjoyed a yummy breakfast with lots of delicious Smucker’s jams and syrups and of course Hungry Jack pancakes and waffles. We also had a special visitor – Mr. Smuckers himself joined us for breakfast and to share with us a little of the company history and culture. 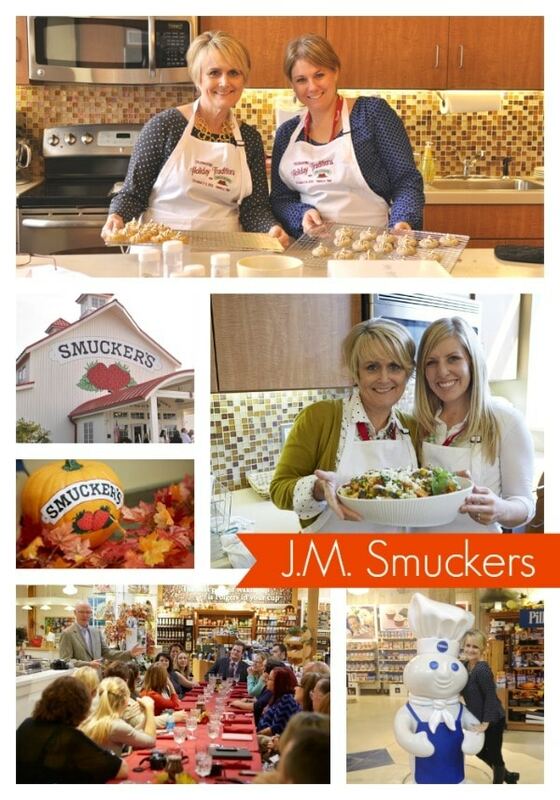 Smucker’s has a wonderful culture that is based on always putting their consumer first and meeting their needs. It is has been the philosophy of the company from the very beginning and it has definitely worked well for them. 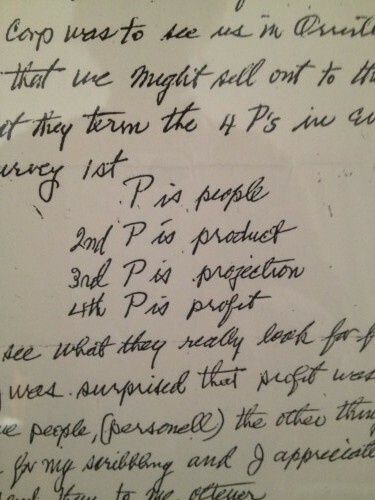 I took this photo while we were touring the Smuckers home – it is from a letter that J.M. 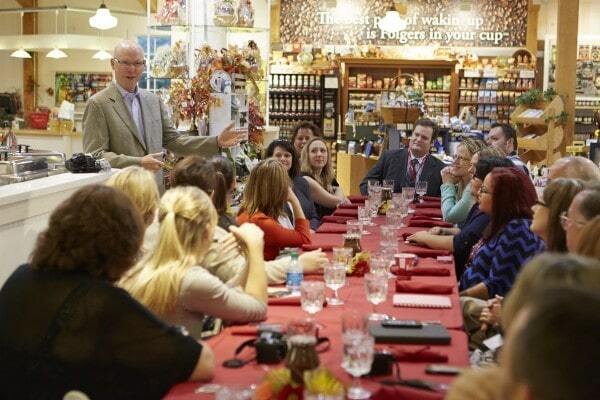 Smuckers wrote to one of his grandsons in regards to his philosophy for doing business: People are always first! 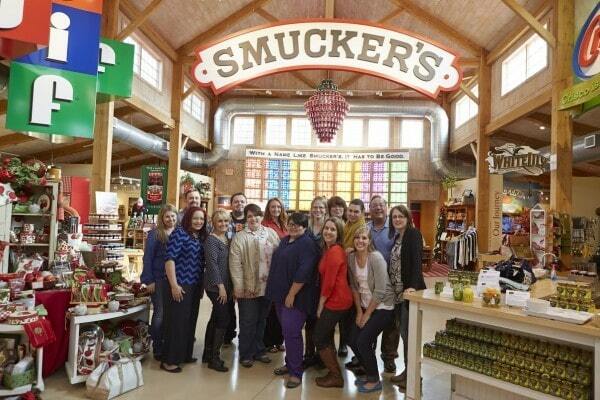 After breakfast we were treated to a shopping spree in the Smucker’s store – so fun!! And of course a few more photo opps! Bloggers love their photos. 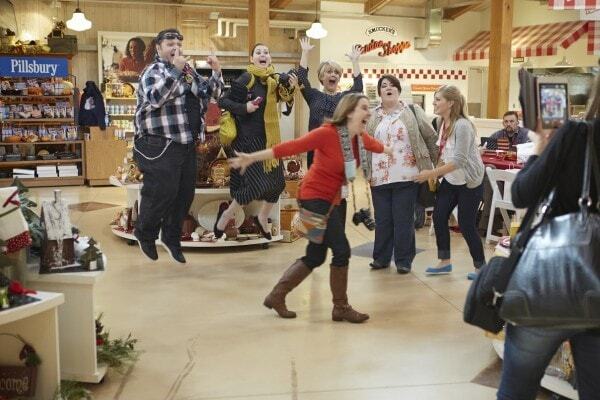 And of course a jumping photo and a photo bomber! I think the afternoon of our second day there may have been my favorite. 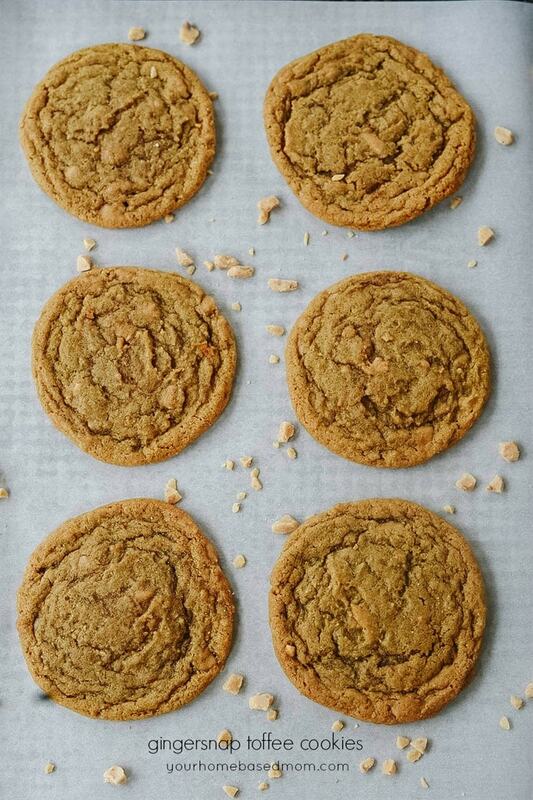 We had a fun session on hosting a cookie party. 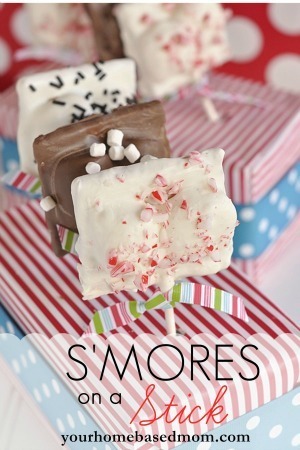 We got to get back in the kitchen and do a little baking and then we did a little crafting! We teamed up again and I got to meet and work with Tiffany from My Litter. As I have mentioned already – one of the highlights of the trip was meeting so many new blogger friends. 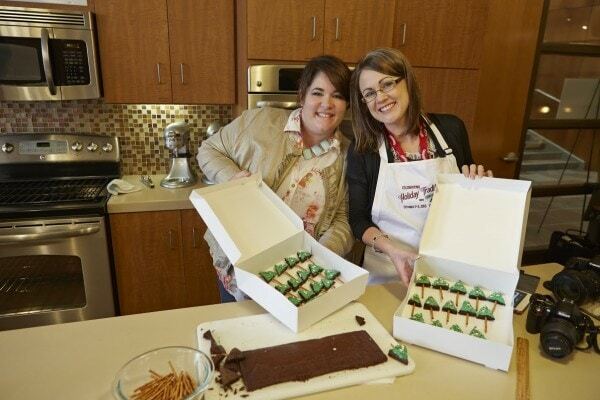 Here are two more of my new friends with their yummy creations. 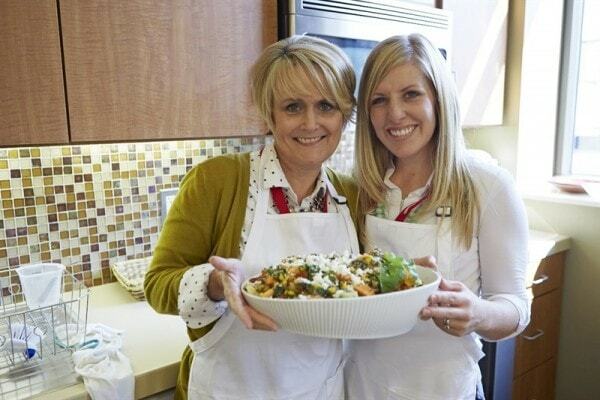 Heather from Whipperberry and Sarah from A Thrifty Mom. We then got to do a little crafting and create our own fun container for our cookies. We did some glass etching which I had never done before! 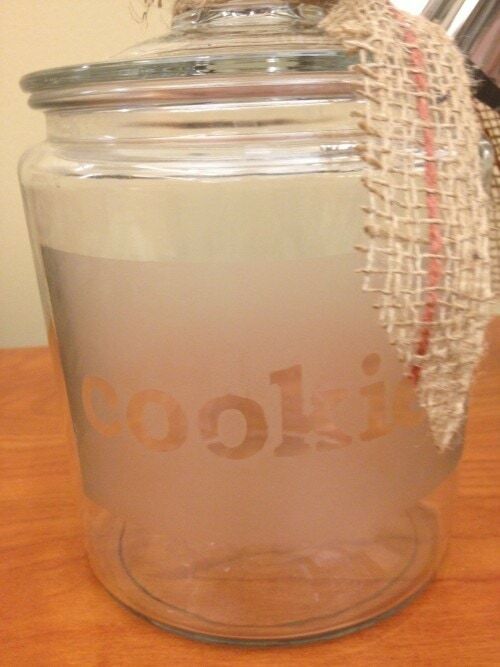 Here’s the fun cookie jar I created! 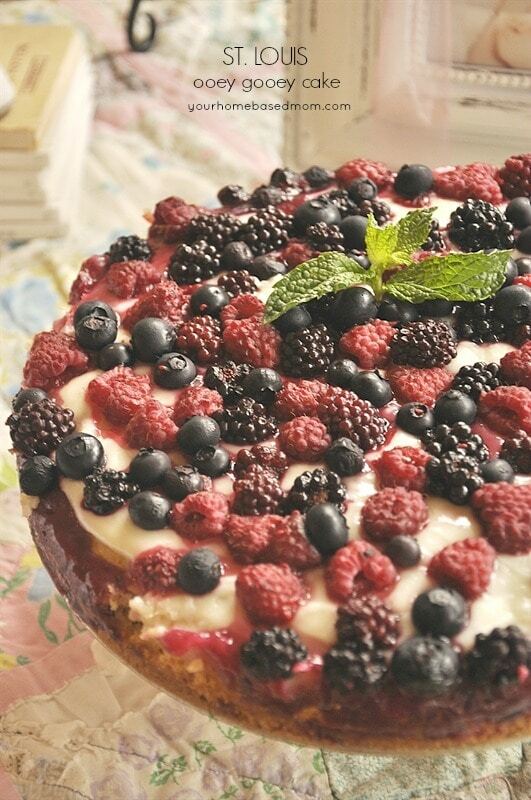 We then had a fun session with a professional food photographer and a food stylist. 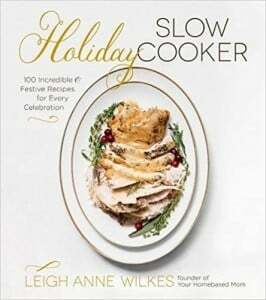 Learned lots of valuable tips and ideas for improving our food photography. 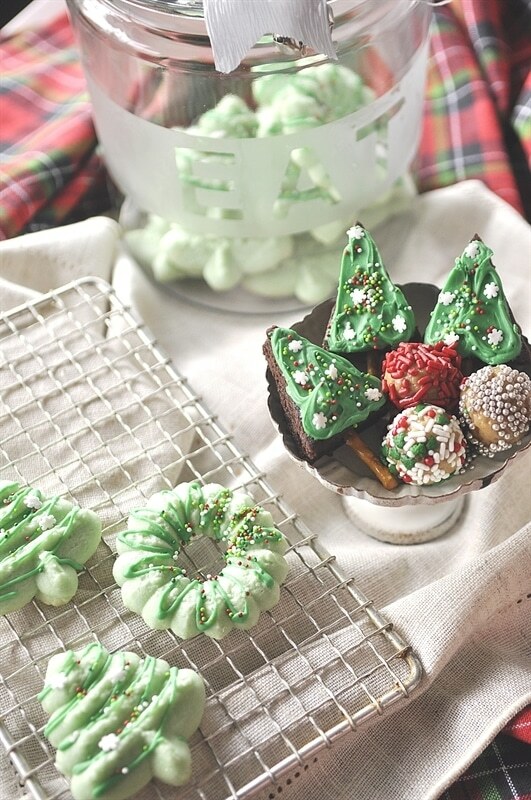 Heather and I worked together on some food styling. 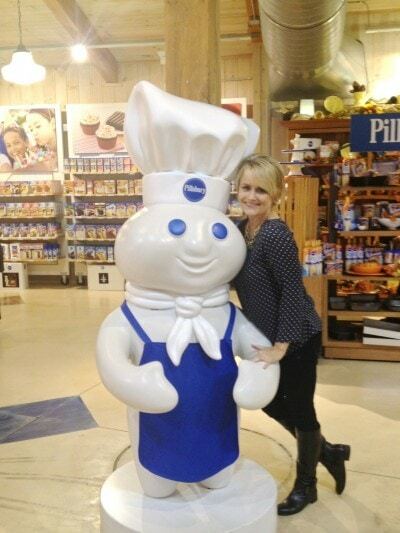 I couldn’t leave without a photo with the cute Pillsbury Dough Boy! We then headed back to the airport! What a fun, jam packed couple of days we enjoyed thanks to J.M. Smuckers. 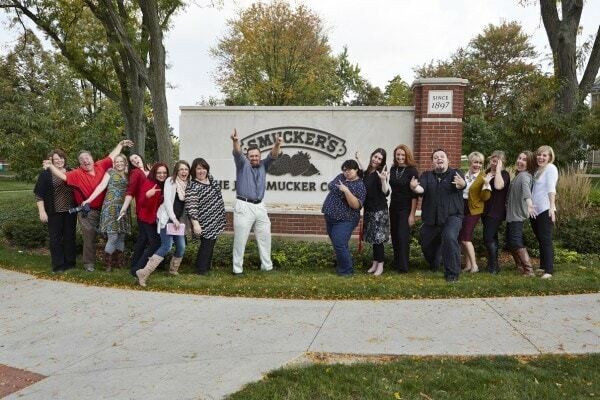 Thanks Smuckers for a wonderful trip! awwwww, I had so much fun with you my dear. I just fell head over heels in love with SMUCKERS!! 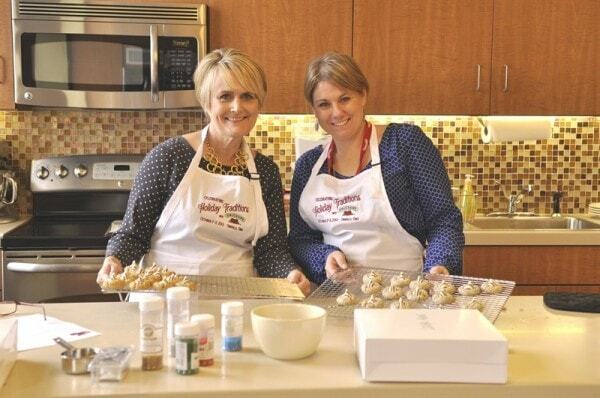 Smucker’s is an amazing company – a true American success story and I am glad I got to learn all about it with you Heather! that sounds like so much fun, I’m kinda jealous and can only dream of being invited to such an event some day. you are adorable, my friend, I hope I’m as adorable as you when my kids have flown the coop. i read every word, what a great adventure! It was very fun and you will get your chance soon I am sure!!! Appreciate you friend! 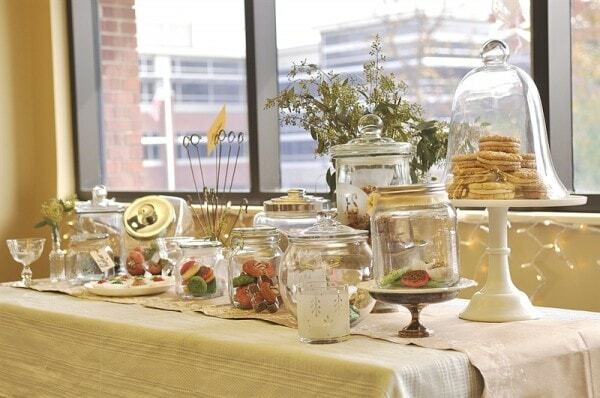 So how do you make those cool jars?? 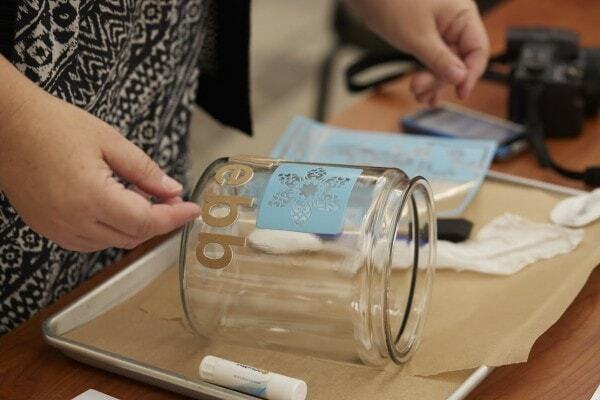 It is a product called Glass Etch – Martha Stewart craft line carries it. You just apply a stencil to the glass and then cover the open area with the product, let it sit and then rinse it off. Super easy! That sounds like such an amazing experience. Was this event only for blogger? Do you know if they have tours for everyday tourist? Are those shops and/or workshops open to the public? This trip was for bloggers but their shop is open to the public.